Local chroniclers Jean Gougnard and Paul Erève wrote that in the place of the present castle, there existed 7 centuries ago, a secondary house of the Order of Templars dependent on Villers le Temple. If nothing supported their writings, during various earthworks executed in the late nineteenth century and the 1930s, old foundations were found in the inner courtyard of the castle. Note also that “the Dictionary of Belgian Municipalities” mentions: “the old castle of the Knights Templar”, rebuilt in the sixteenth century (1588) and formerly called the “Castel of Good Hope”. The publication of Théo Pirard, “Villers le Temple, the land of choice of the Knights Templar and the Order of Malta” tells us: “In 1312, Pope Clement V institutes the knights of Saint John (Order of Malta) and names them heirs of the property of the Knights Templar. The castle of Bonne Espérance is included in a statement dated 1313 and containing the list of properties dependent on the Commandery of Villers. Origin of the name. The name “Good Hope” could have a religious connotation. There is indeed in Hainaut an abbey bearing this name. But she had no property in Tihange. If, as one thinks, the old Templar castle rebuilt in the 16th century depended on the abbey of Villers le Temple, the calm of the place conducive to mediation can be at the origin of its name. In addition, the underground to hide or escape were also a hope of salvation for more than one. The name is cited many times in notarial acts of renting, renting or selling the property. Unfortunately, we are not aware of the existence of any engraving of this time. 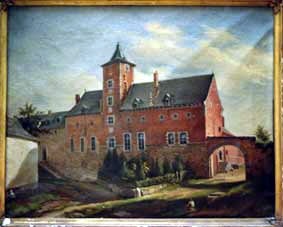 The castle as we see it today dates from the year 1588. It was at this time that the Audace family – from Piedmont – bought the property of Good Hope, rebuilt and developed the site. Over the centuries, the estate will pass into the hands of different families. The Hecking family, which occupied it from 1875 to 1911, carried out extensive interior and exterior improvements. The old saddlery and the 2 stables will also be restored at the end of the 19th century. In 1911, the Knight Pol de Laminne acquires the patrimony and sells it the following year to Baron de Loën d’Enschede husband of Marie Claire Vandevelde. In the courtyard of the Commons, the Baron de Loën d’Enschede will build the small tower rubble with four-sided cloche, according to the plans of the architect Balat. This tower contains a reservoir for the distribution of water throughout the castle. After the death of the parents, in 1967, the sharing of the castle, outbuildings and land is between the heirs (1 boy, 4 girls). In 1988, Dr. Mitiku Belachew and his wife, Mrs. Danielle Corman purchased the central part of the castle – a legacy of Baron Emmanuel. We have occupied the main part since February 2000. 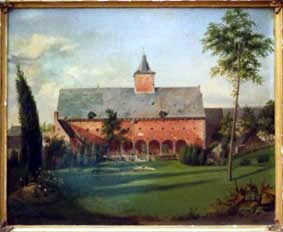 On the death of the last two heirs, Gisberte and Hélène de Loën de Enschede, in January 2001, we bought out Gisberte’s share and Hélène’s land. The old estate today has 5 ha and is partly restored. 2016: the castle underwent a major facelift. Indeed, the entire roofs and facades have been restored thanks to the contribution of the Heritage Service of the Walloon Region.